Accessibility and Collaboration – Breaking down the exclusivity wall, bringing ideas together to create something better. Can a simple system that assists in cultivation, harvesting, and connecting do that? We believe it can. A simple modular system that focuses on a community’s specific culture, climate, and needs for clean water, abundant food, energy and connection to information available. A modular system focused on harvesting energy from air, water, solar, and other environmentally safer methods; that assists in development of food cultivation most efficient for the area; that assists in delivering an easily obtainable information connection. A system that will encourage cooperation and independent development. We believe this system can ‘go viral’ and encourage people who already want to help to help. Technocracy is a non-profit interested in educating and empowering people since 1933. Lack of access to power, food, water, information, and global communication in isolated communities is a complex problem. 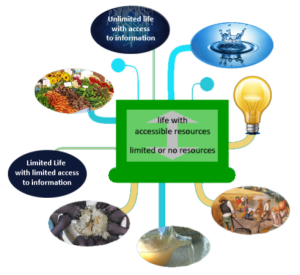 Inaccessibility is especially problematic for disempowered people who are dependent upon the ‘outside’ world for resources, often creating a subjugated community. An exclusive disposition harms society, the environment, and plays havoc with the economy. The fear of scarcity is pervasive and those who have resources or knowledge are often afraid to share out of fear due to concerns that they will lose what they do have. Profitization and sequestering of knowledge also hinders the progress of science and society, creating a deficit in our knowledge economy. Profit-determining business direction is sound procedure, but the significance of such decisions is often short-sighted in regards to overall global impact on the health of: the environment, social psychology, and long-term economy. We need to clarify and define environmental, social, and industrial wealth to assure long-term healthy economic decisions. Mankind has the technology, knowledge and resources to provide production and distribution with environmentally safe methods, but lacks universal accessibility to those solutions. Many organizations are trying to, and do, help in specific areas, but lacking is an attitude of collaboration, transparency, integration of technologies, and comprehensive systems. Those without access are often left at step one: inventing the wheel with all the redundancy and risks connected. Company and organizational transparency with paralleling and sharing research can be more productive for the creation of environmentally sound technology than ‘going it alone’. WE ARE NOT ALONE IN THIS THINKING! There is an amazing machine that can provide internet access, some energy and clean available water. It is huge, it costs a lot, but, the world is on the right track.